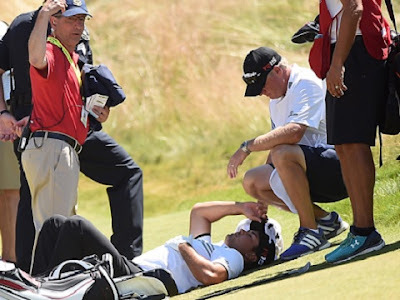 Many readers will have been concerned when they saw Jason Day collapse while playing his final hole of the 3rd round at the 2015 US Open, at the Chambers Bay Golf Course, Washington. It later transpired that Jason suffers from a condition known as benign positional vertigo. Fortunately, he received immediate medical assistance and was able to complete his round after a short delay. The player must not discontinue play unless: …. …. (iv) there is some other good reason such as sudden illness. Q. During a round, a player is incapacitated by heat exhaustion, a bee sting or because he has been struck by a golf ball. The player reports his problem to the Committee and requests the Committee to allow him some time to recuperate. Should the Committee comply with the request? A. The matter is up to the Committee. Rule 6-8a(iv) permits a player to discontinue play because of sudden illness and the player incurs no penalty if he reports to the Committee as soon as practicable and the Committee considers his reason satisfactory. It would seem reasonable for a Committee to allow a player 10 or 15 minutes to recuperate from such a physical problem but ordinarily allowing more time than that would be inadvisable. A final point is that if the player discontinues play without specific permission from the Committee, he must report to the Committee as soon as practicable. If they do so and the Committee considers their reason satisfactory, there is no penalty. Otherwise, the player is disqualified. I was pleased to hear that David Fay, of Fox Sports golf broadcasting team, drew viewers’ attention to the possibility that tour pros, who use the AimPoint green reading system, could be penalised for walking on their line of putt. Q. May moss, or a creeper, in a tree be removed if its removal would improve the line of play? A. No. Trees are the natural habitat of some mosses and creepers. Accordingly, such plants growing in a tree may not be moved - see Rule 13-2. Moss or a creeper which has fallen to the ground, and is not growing there, is a loose impediment and may be removed, without penalty - see Rule 23-1. Click here to see Europe’s favourite golfer play a different type of stroke to get out of a difficult lie on the famous ‘Road Hole’ at St. Andrews Old Course, during the last Open Championship that was played there, 5 years ago. I understand that Jordan Spieth tried to replicate this four times during his practice round on Tuesday, without the same success. If you would like to purchase my book, ‘999 Updated Questions on the Rules of Golf’, but want it in a paperback version, rather than the eBook format that I deliver at this link, then click here. Why are you pleased that players may be penalised for walking on the lines of their putt? There is no ruling on this is there? Or does it classify as improving the lie of the green or some such? Seems a bit silly to me, but then there are plenty of silly rulings in this great game's rule book! Let me refer you to my recent blog on the AimPoint system for reading the greens (29th April 2015), in which I tried to explain the Rule about walking on one's line of putt with reference to Decision 16-1a/12. I also commented on how this method may also have the effect of slowing down play and breaching the good etiquette of not walking on fellow competitors' lines of putt. So Jonathan thinks walking on the line of your putt is okay! Why not carry a little roller device and smooth it out while you are walking? I am waiting for someone using the ridiculous AimPoint method to shuffle down both sides of their putting line and then putt over where they have walked. In match play, that's my hole, I believe, Barry? What shall I do if I am marking his card in strokeplay? My recommendation is to bring the fact that they are walking so close to their intended line of putt that they risk incurring a penalty. Then, if it happens again, tell them that you will have to inform the Committee before signing their card. The Committee may give the benefit of doubt to the player and not penalise them, but hopefully it will ensure that they are more careful/considerate in future. Who decides? The players in the match or the committee? It is an unfortunate situation but Decision 6-8/3 clarifies that the player forfeits the match if they cannot continue play within 15 minutes, or so of incurring the injury.